I spend a lot of time in the kitchen and when I am developing recipes I like to have the notes section of my phone at hand so that I can make notes of the stages and quantities I use. The problem with this is that either I have dirty hands and make my phone gruby or I can't find my phone amongst all the ingredients etc that are scattered around on the kitchen top. To solve my problem I have a really nice helper in my kitchen who holds my phone for me. No its not another person instead its my "Lazy Arm". What is a lazy Arm? 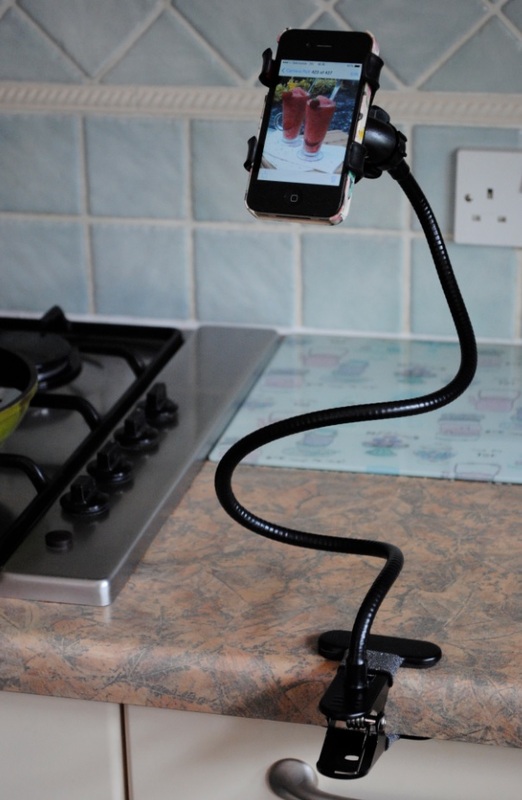 Lazy Arm is a flexible smart phone holder, that is easy to mount onto any surface. 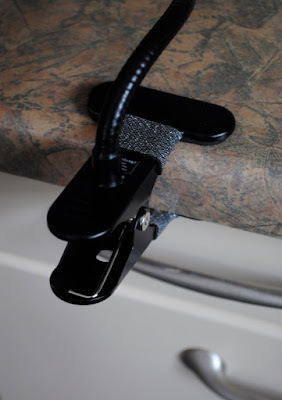 There is a bulldog like clip at the bottom of the holder which clips onto to any work surface, table edge or chair. Following from the clip is a flexible arm that is made from heavy duty metal and will bend in any direction you wish. 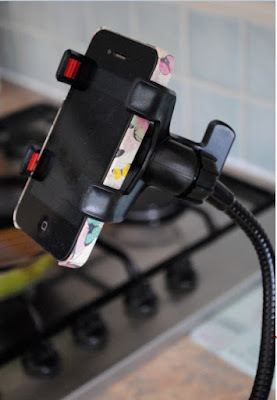 Attached to the end of the arm is the an adjustable phone holder clip which will hold any size smartphone securely. This lovely gadget would also make the perfect fathers day present so why not order one for your dad. I was sent the Lazy arm to try in my kitchen, all the views and opinions expressed in this post are honest. Genie Gadgets have been very kind and they have offered two citrusspiceuk readers the chance to win a Lazy Arm. Currently a big fan of my half-cushion-half-TV-remote thing, that's a brilliant little gadget! this would be perfect for baking when everything gets super messy! My Smartphone I would be lost without it! My wireless headphones they mean I can listen to music anywhere and I don't have to have my phone in my pocket all the time. my smartphone, I'd be lost without it! Has to be my Smartphone because it's so many different gadgets in one. My Favourite gadget is my iPhone, I use it for everything, well except making phone calls!!!!! I love my tablet and my headphones so I can block out my husband complaining!! Oh that is a hard one - it would have to be my phone. My current favourite is my tablet. Since the local bus network introduced free wifi it's made catching up with everything on the commute so much easier than squinting at my teeny phone screen! My fave gadget is the app on my phone that tells me where I've parked my car! Fav gadget is probably my iPad. My Android Box is a very useful tech gadget. I wouldn't be without my electric can opener! Seriously, I love it! My smartphone it's amazing how much technology has moved on in 15 years! it has to be an ipad as it can just do so much! I love my HTC M8 Phone, best one I've ever owened! My iPhone - I'd love to present it with this nifty gadget! My phone charger case is great in a pinch. Thats not for me but my husband need one or 2! It's my phone - I was late getting one, but now I'm never off it! Cannot live without my iPhone! My iPhone - it can do so much, I would be utterly lost without it. It's fab, still does all I want even though it's dated (4s)! I have a Bluetooth speaker I use with my phone. It's great quality and I can listen to my music in the shower without having to take my phone in the bathroom and risk ruining it. It has to be my smartphone, don't know where I'd be without it! It would have to be my power bar. it is a life saver when my battery is low. My internet hub - without the internet how would I use my laptop? My iPad! Means I can watch youtube in the bath! !